MONTREAL -- Elementary school teacher Evelyn Bissonnette asks her 14 young students to stand up, one by one, and introduce themselves. "Hello," a confident young boy says in French. "My name is George and I am seven years old and I speak French, Arabic and English. And I come from Syria." George moved to Canada less than two months ago and already speaks French with little to no Arabic accent. "And do you have any brothers or sisters?" asks Bissonnette, whose French-integration class includes 11 Syrian refugees aged six and seven. "I am seven years old," is his memorized reply. While his accent is spot on, he is not yet fluent. Bissonnette said that within three months, however, most of the kids understand and speak French with ease. She is on Quebec's front lines in the resettling of thousands of refugees the province wants to welcome as part of the federal government's pledge to bring in 25,000 Syrians fleeing their country's civil war. 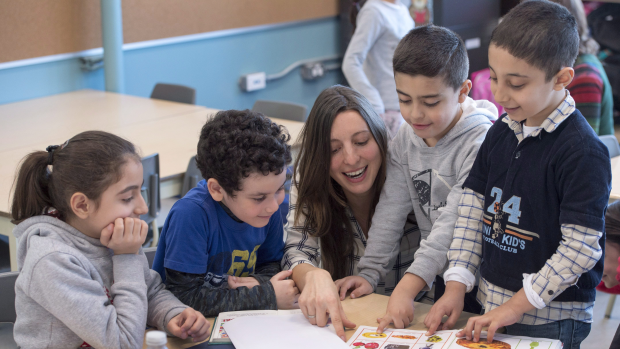 While Syrian children are being integrated into classrooms across the country, Quebec's strict language laws force refugees settling in the province to have a sufficient knowledge of French before they can attend regular school. "They learn fast," said Bissonnette. "I repeat things often and a lot of the learning is non-verbal at first." She teaches one of 10 so-called "welcome classes" offered at Ecole Francois-de-Laval, in Montreal's Ahuntsic-Cartierville borough, which has become home to a significant percentage of immigrants, not just from Syria, but also from North and Central Africa. This year's 10 classes, for children aged five to 12, are a record and reflect how immigration to the area is rapidly changing demographics. "Twenty years ago this neighbourhood's population was shrinking," says Francine Caron, a social worker who acts as a link between the school and several community organizations. "Last year we added an annex to the school," she said, standing in the new building. "This is the first time we've had so many welcome classes. A lot of refugees and other immigrants are coming to this neighbourhood, from Lebanon, Egypt, Algeria. Housing here is cheaper." Bissonnette's classroom looks like any other, with posters of capital and lower-case letters lining the walls that surround giggling and laughing children. She lets the kids colour on their own. Slowly, the steady hum of kids talking starts getting louder. Bissonnette says due to the initial language barriers, the refugee children "need a lot of content" so she makes sure to teach math every day. "You don't need language as much for math so it helps them feel competent," she says, as some of her kids begin to sit on top of one another, the giggling getting ever louder. A young boy walks up to the front of the class and reveals how someone has drawn a red line with marker across a page in his workbook. "Did Edmon do that?" Bissonnette asks. The boy nods and walks back to his seat. "Edmon is my little disturber," she says lovingly about the seven-year-old, who is also from Syria. "He likes to hide the water bottles." The room's noise has become overwhelming. George is sitting with another three kids on top of him. All are squealing in delight. Bissonnette has let things go on long enough. "OK everyone, back to your seats," she says softly in French. Bissonnette says non-francophone immigrants stay in welcome classes for one year on average before starting normal school, but adds the curriculum she teaches is virtually the same as in regular classes. So far, both Caron and Bissonnette say the resettling process has gone smoothly and the children, at least, seem to be integrating well into Quebec society. One major reason is due to the fact the majority of refugees who have so far arrived in Quebec were privately sponsored and most have strong family or community networks already in the city. As the number of government-sponsored refugees increases, however, their jobs might get more difficult. But neither Caron nor Bissonnette appears particularly concerned. "We'll wait and see," Caron said.